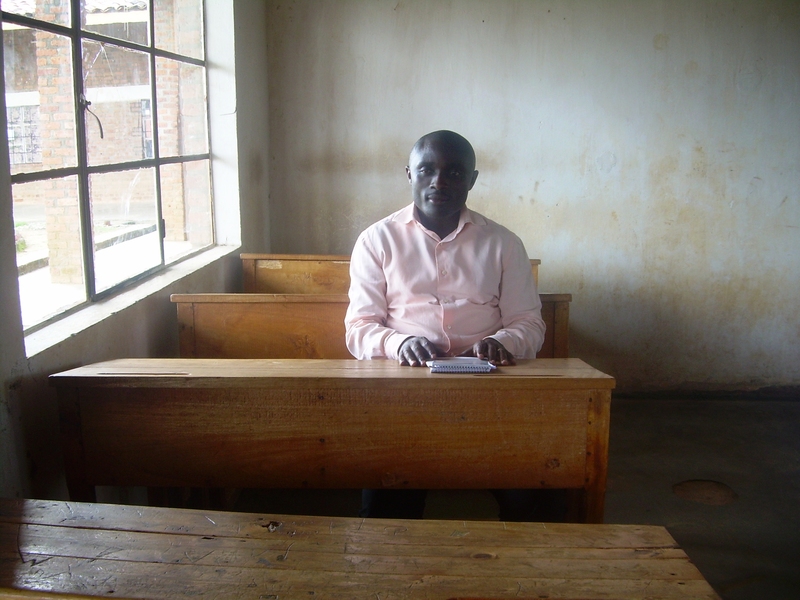 Phanuel sits at his school desk where he was that fateful day when rebels burst in and starting shooting students. On the floor you can still see the grenade hole. Phanuel Sindayiheba is a survivor – and a national hero. He will never forget what happened, the scars remain etched on his body and in his mind. It was March 18, 1997, three years after the genocide. He was studying at secondary school in Nyange, a region riddled at that time with unrest as rebels waged their battle against the new government. Buses were stopped and burned. People intimidated. And then one day, an attack on students. Last November, Phanuel joined us at peace camp for a memory walk to his former school where the attack took place. He shared some of his story. Here are some excerpts. The shock is still there, flashbacks, when I go back to that event. 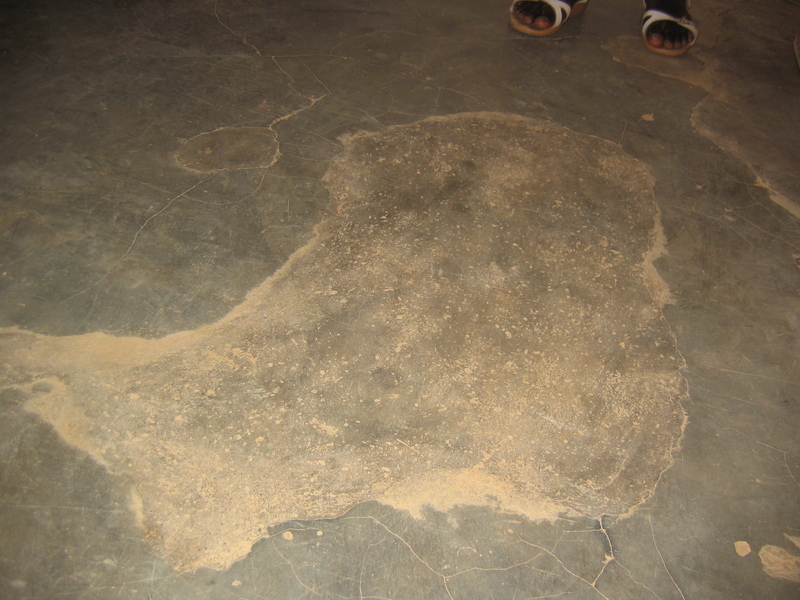 In 1995, after the genocide there were bodies everywhere, you could see people’s wounds and trauma, many of the perpetrators were still living in the rural areas and not yet in jail. In 1996-97, the rebels were still fighting against the new government and in this area you could hear the bullets and bombs. At school, we were from different backgrounds — children from Hutu families, where in those years many felt that a Hutu was equal to a genocide perpetrator so children from those families were ashamed of being Hutu; children from Tutsi families who were traumatized; and children who were from Burundi, Tanzania, Uganda, Congo, who had never lived in Rwanda and grew up in refugee camps with stories about a bad Hutu who kicked them out of Rwanda. So you take all these children from different backgrounds and put them in one school, let them eat together, fetch water together, sleep in the same dorm, sit on same bench. At first, we stayed within our small groups – Burundi with Burundi, genocide survivor with genocide survivor, those with fathers in jail. But after three years, we had become one. On March 18, 1997, it was around 8 pm, the main gates were locked, we had finished dinner and some of us were back in our classrooms reviewing our notes. I was in Class 6. We started to hear gunshots, but thought it was nothing big, that it was just rebels fighting soldiers. But after 15 minutes, the noise kept increasing instead of reducing, and we wondered what was going on. Then we saw fires outside and bullets started to hit the windows. I told everyone to lie down on the floor so bullets wouldn’t hit us. The bullets kept increasing and all the windows were broken. After a few minutes, it stopped and then three young men with machine guns burst in. They tried to disguise who they were, wearing both military and civilian clothes, and hid their face and eyes. “Do you know me?” asked one of them in a crazy, crazy kind of French accent. He looked like the leader. We all heard him clearly and we knew what he wanted. Everybody kept quiet. So he repeated his command a second time. “We do not have Hutus or Tutsis here, we are Rwandans,” said one girl, Chantal. Thinking that she was confused, they went outside and threw two grenades inside, into a small room like that. Some students were blinded, others had their legs cut off, others were crying. The first grenade actually created a big hole in the floor. The second grenade fell on my back. So they shot both him and Chantal immediately, in that same moment. When he replied that way, even after they had thrown in grenades, they realized that nothing would change our minds and they started shooting us, row after row. One of the rebels guarded the door so no one could escape. I was in the third row. A grenade is the worst thing, if you see how they prepare brochettes, my back was like that, and I had this thought to just raise my head from under the desk so they shoot me and I die. But then I had another thought. Something else inside my mind that said that this would be suicide, please, don’t stick your head up. Five bullets hit my arm. Some details from this night I’m not going to say here, but when they shot us, a girl asked me to pray because we are going to die. We prayed and I asked them to remember the word we read in Hebrews 12:14, to be at peace with everybody. Another group of rebels went to Class 5. When they got the same answer as the one we gave, the answer was given by Helen, a girl whose dad was in jail suspected of genocide crimes, they got mad immediately. As one of the rebels grabbed her she said, “Are you going to kill me, and yet I know you.” Realizing that she could identify him, he shot her. Another student, Valence, who had actually lived with soldiers as a child solider, but was back at school, tried to stand up and take the rebel from the back, to save Seraphine, another girl who the rebels recognized. They killed him, too. Students in the other classes ran and hid down in the bush. So the night passed like that. Six students died, many others were badly injured. Once soldiers in the area realized that rebels had attacked our school, they came to help us. All night they and other students and people from the community took care of us. In the morning we were loaded into local taxis and taken to hospitals. Because of the extent of my injuries, I was in hospital after hospital, for a whole year. Some students returned to school after two weeks, but others were too traumatized to come back. Later on the Government recognized what we did and made us national heroes. Many of my classmates still suffer today from their wounds, crippled in their body or psychologically wounded. In 2002, we started an association called KOMEZUBUTWARI, Continue Being a Hero. We’re trying to do our best to promote peace and to help youth become the peace makers. We also do advocacy for those who are blind or crippled, but would like to continue to study. Here are just some of the questions youth had the opportunity to ask. Youth #1: You told us about being in different groups, from different backgrounds. How did you manage not to separate yourselves? Phanuel: There are three things that helped us to become one. The first one is the personal values you should have, but also important is leadership. We had an old guy who was in charge of religion, a chaplain, and his slogan was, “Do the good things so that evil may be destroyed” and there were some teachers and parents who were good examples, encouraging us to love each other and help one another. The second is the power of the word of God. I was one of the leaders of a worship group where Catholic, Protestant and whoever else wished, would gather together, and we kept stressing peace, love, unity. We became strongly united. After three years, nobody wrote a bad message in toilets. In the very beginning, you could see these things, but not after three years. The third thing is the government policy of unity and reconciliation, to live at peace with everybody. We were motivated by the way they looked at things. Youth #2: I want to really understand that power that animated you. The genocide was just a few years back so the wounds were still fresh and there was that bad spirit, tell us, practically, we want to know, practically, how you managed to have that courage? Phanuel: Besides the things I just said, I am a Christian and there is my family education. 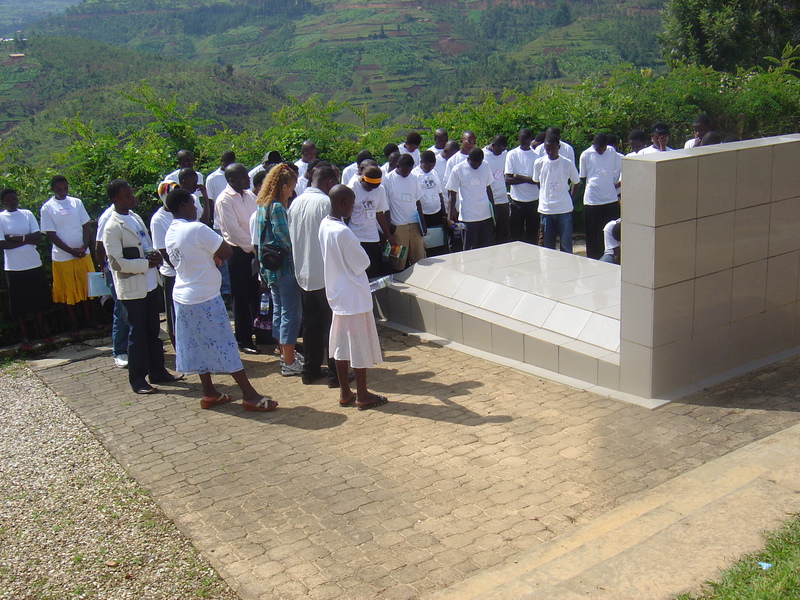 In my family, we didn’t have problems between Hutu and Tutsi, and during the genocide I saw people helping each other so I could not personally tolerate somebody killing a neighbour. So the reason I didn’t stand up, it’s my education from my family, the experience I’d seen in the genocide and the word of God that was in me. I was a youth leader, and if I preached that people should live in peace, I could not stand up. In Class 5, Helen was also reading in the Bible that night to students, from Romans 8, where it talks about what can separate us from the love of Christ. Is it death? Is it persecution? Is it hunger? Nothing can separate us from God’s love. We were deeply grounded in the word and that‘s what helped us a lot. Nothing could separate us because in the last three years we had been training ourselves to love each other. Youth #3: I’m wondering if those rebels, when they were later integrated, brought back into the army, does the government trust them 100%? Phanuel: Let’s focus on a typical experience we can relate to, like somebody living in the rural area. Somebody who just repented about what he did in the genocide, what do you think, do you trust him? Many dilemmas come in, somebody might repent and totally change, because the Bible says that someone in Christ is a new creature, and the past is gone and everything is new, so somebody can change, but there are some people who can repent only for their own interests. It’s only God who knows the hearts. Youth #4: The rebels came here and killed people and today they are in the army. Then the rebel is promoted, has a big rank, and I (a soldier) am not promoted. I may do crazy things like take revenge. What do you think? Phanuel: I’m a civilian, so I’ll answer you as a civilian. Think about somebody who killed five, six people, he took responsibility for his actions, served some time in jail, and now he’s back, he has cars and a good house and more than anybody else, and there is a genocide survivor living in a small house of 25 iron sheets. Do you think these people can keep living together? That’s why we are here in this peace camp. I read the logo you made, youth catalysts for peace. You know in chemistry what a catalyst is – something that improves, accelerates, the reaction, the chemical. So seriously it is hard for them to cohabitate, but that’s why you are here. You are catalysts. You have to accelerate people, bring them together, help people who could not otherwise live together be able to live together. That’s why we have these initiatives like peace camps, for people like you who say I need to take a stand, a step, to do something. We are investing in you, sowing seeds, so that you may go and help our society. It’s a big, big challenge, but you have to do it and we are here to help you make a better future. 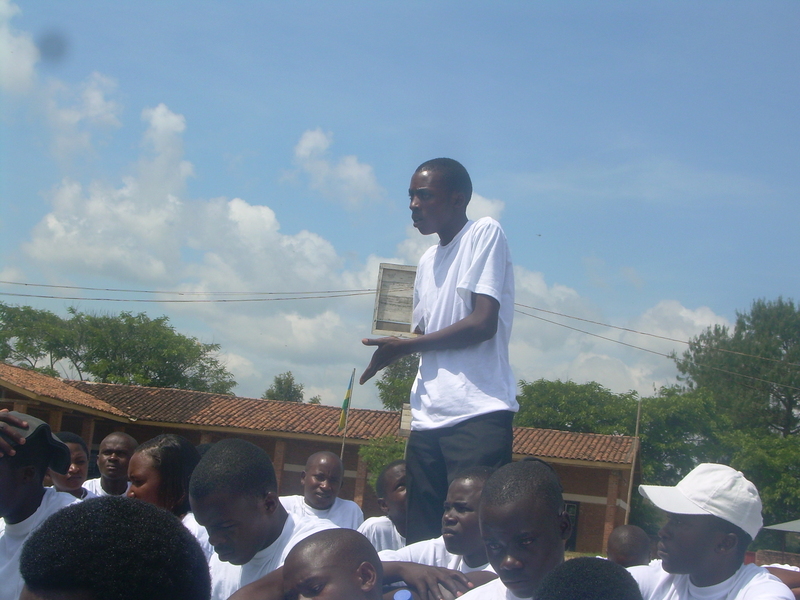 Since the peace camp, several youth have already started their own peace clubs at school and in the community. They have become real catalysts for peace. See more photos from peace camp and our memory walk. Short film: Learn more about what happened on March 18, 1997, see One Night at Nyange by Jean Claude Uwiringiyimana. Read a book: Phanuel’s story is featured in As We Forgive, by Catherine Larson. 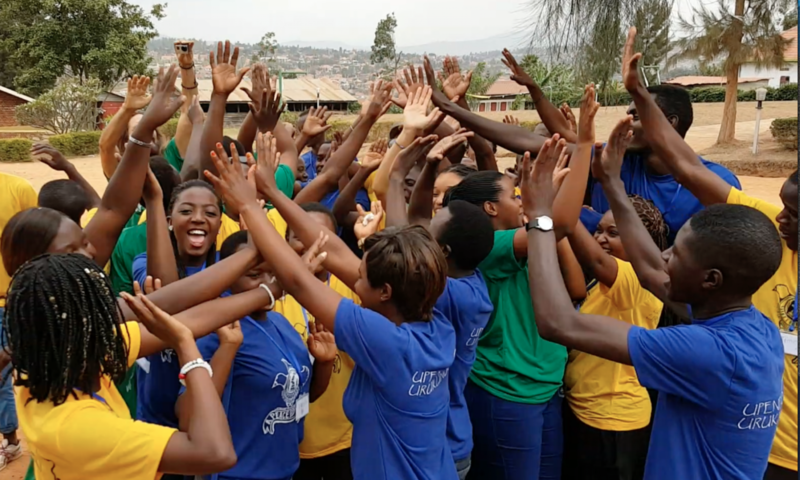 Give a gift: Help sponsor more peace-building activities for youth in Rwanda. what a story of God’s intervention into survivors’ lives!